"Akai" redirects here. For other uses, see Akai (disambiguation). Shuichi Akai (赤井 秀一 ,Akai Shūichi?) is an FBI agent and a major figure in the battle against the Black Organization. He once assumed the identity of Dai Moroboshi (諸星 大 ,Moroboshi Dai?) and infiltrated the Organization, where he was given the codename Rye (ライ ,Rai?). During this time he made enemies with Gin and became romantically involved with Akemi Miyano. He is the older brother of Shukichi Haneda and Masumi Sera. Shuichi as "Dai Moroboshi" during his infiltration of the Black Organization. Shuichi Akai is a British American of Japanese descent, originally from England, and is a member of the American Federal Bureau of Investigation, on special assignment in Japan to capture Vermouth. His superior is James Black and his partner is Jodie Starling. He had infiltrated the Black Organization under the name Dai Moroboshi - and the codename "Rye" - as a mole and dated Akemi Miyano, one of their low-ranking members, to feed information to the FBI. In order to facilitate the latter, and later because he had genuinely developed feelings for Akemi, Shuichi saw himself forced to break up his then on-going relationship with Jodie. Later on, his cover in the Black Organization was accidentally blown by his colleague Andre Camel, and when Akemi was killed, he declared her murderer, Gin (with whom he seems to have had some tensions even before his exposure), his personal enemy. 17 years prior to the current timeline, Shuichi's father, named Tsutomu Akai got himself involved in the murder case of Kohji Haneda and Amanda Hughes and disappeared. In his last message he instructed his family, Shuichi, his pregnant mother Mary and his younger brother Shukichi, to hide in Japan, but Shuichi, determined to investigate his missing father, convinced his mother to let him study in America. After he left Japan, his younger sister Masumi was born. Shuichi didn't get to meet her before he returned to Japan after seven years in the states, but Shukichi sent him pictures of her. After he had finished school, he joined the FBI. Five years prior to the current time-line, FBI agent Shuichi Akai infiltrated the Black Organization using the alias Dai Moroboshi as a mole and dated Akemi Miyano, one of their low-ranking members, in order to meet Shiho Miyano, a high-ranked member codenamed Sherry, and use her influence to get into the Black Organization. Although at first he was simply using Akemi as a tool, they both fell in love with each other. Shuichi distinguished himself as an agent and two years prior to the current time-line received the codename Rye and was called to work under executive agent Gin. The FBI laid a trap hoping to capture Gin at a warehouse where the meeting was supposed to take place, but the Black Organization discovered Akai's true allegiance and Gin never appeared. He broke up with Akemi to protect her and he lost contact with her after the mission to capture Gin failed. Two years later Akemi got killed by the organization to cut loose ends. Shuichi is a tenacious but stoic agent. Even in personal matters, he remains cool, even detached, from anyone, but his redeeming value is a great sense of loyalty to anyone he knows. He is a skilled and relentless pursuer and detective, qualities which have labeled him the number one enemy of the Black Organization and earned him the nickname "Silver Bullet". He looks forward to opportunities to hunt the Black Organization down and get revenge for Akemi. While usually professional, he often acts independently of the FBI, and even his boss James Black has trouble getting ahold of him. Shuichi gets along well with Conan, who share many personality traits. Despite that he has American citizenship, he still considers England as his home country. James Black describes Shuichi as an introverted person who doesn't easily get close to people, and further notes that Shuichi has become even more closed off since Akemi's death. Shuichi doesn't often voice what he is thinking and has an unhealthy tendency to prioritize his missions above the emotional well-being of his friends, co-workers, family, and love interests. Conflict between his missions and the interests of those he cares about has lead to significant sorrow for him and others. Shuichi prefers to plan secretly, and will readily trick his friends and coworkers, even injuring them, if helps the success of his missions. Shuichi is often forgiven for these transgressions because his judgment is usually sound and his plans work out well. Shuichi's secret plans, while strategically robust in the short term, often cause emotional problems for others that he does not fully appreciate. Even though he means well, Shuichi is notably clumsy at trying to comfort and connect with others. He is especially dense at recognizing the motives behind the feelings of others and thus how to modify his own behavior to improve relations. As Subaru Okiya, his technique to approach Ai Haibara leaves her terrified of him, and repeated contact only intensifies her loathing. Ten years ago, he was also cold to young Masumi on their first meeting, brushing Masumi's silly antics aside without realizing that she simply wanted him to smile and treat her kindly, though he most likely was simply in a bad mood, since he just had an intense argument with his mother, in which they traded physical blows, because of his plan to join the FBI after his studies to pursue the case of his father and because he had lied to her about that. Later that day, during the investigation of a case, Shuichi gives both Shinichi and Ran a task to help with the investigation, so Masumi approaches Shuichi shyly and asks for a task as well. Now Shuichi responds kindly and gives her a task that makes her feel important. Despite his social awkwardness, Shuichi is not apathetic. He gives Jodie some hope by leaving her a message in his own handwriting, and leaves her a very roundabout hint about his identity after knocking her down even though he cannot reveal the truth to her yet. Eventually he also realized that Masumi was looking up to him, so he began to send her videos of him doing Jeet Kune Do. Shuichi is a tall man of Japanese descent with short wavy hair. His trademark features, by which people close to him have identified him are his eyes which have permanent bags underneath them that make him appear sleep deprived. Other characters often describe him as evil eyed or having a sharp gaze. His eyes are blue in the manga (like every other character) and green in the anime. He and Masumi Sera presumably more closely resemble their mother then their father. The second trademark feature is his knit cap, which he is always shown wearing. When he was younger he had a grey fedora which Masumi now wears herself. Up to one year ago, he had very long waist length hair, which he cut after the death of Akemi Miyano "to freshen up." Shuichi is left-handed. Ten years before the present timeline, Shuuichi still had short hair, which means he grew it out sometime during the next five years. He is a heavy smoker and his favorite drink is whiskey- he has recently taken to drinking bourbon rather than scotch. His outfit is a grey jacket on top of a collared black shirt, black pants, shoes, and his trademark black knit cap. Shuichi is capable of thinking on par with Conan. He once set up a sniper ambush at a nearby building, knowing that the Black Organization will come and try to kill Kogoro. He also mentioned that he knew that "making them think the FBI set up the transmitter was the priority." In the Paper Airplane Case, Shuichi (disguised as Subaru) matched Conan's deduction abilities, including the use of Morse code and origami. During Yusaku Kudo's Cold Case, Shuichi figured out the key point of Sanada coins, solving the case before Conan and even providing him the hint of "Kumogakure Saizou" to lead him to the same conclusion. During the Delivery Service case, Shuichi was able to figure out Conan's situation in the delivery truck with a mere address change on the parcel. He was able to deduce along with Yusaku Kudo that the hints of ASACA and MASCARA lead to the name of the Boss of the Black Organization, Karasuma Renya. Shuichi, is the most capable sniper shown so far, to the point of shooting a small piece of gum out of Gin's hand from about 700 yards away, which is a lot more than the range of Black Organization's professional snipers Chianti and Korn. He also managed to get a shot on Gin from the same distance. Shuichi is good at handling shotguns as well; he accurately shot Vermouth from the hip faster than she could aim at him with her subcompact pistol. He is a sharpshooter with a handgun as well, capable of busting a moving car's tire from a speeding car with just a single shot. Shuichi uses Calvados' SPAS-12 shotgun to bring down Vermouth, an Arctic Warfare Magnum sniper rifle to shoot Gin, and Rikumichi Kusuda's Glock pistol to disable Rei's subordinates. Akai is unusual in that he is "eye-bidextrous" while shooting. Like hands and feet, most individuals have a dominant eye they prefer to use when lining up a shot, but Shuichi is shown using both eyes at different times. Shuichi is a skilled driver. He can overtake many cars quickly in heavy traffic conditions and drift around a U-turn. He drove a Chevrolet C1500 which was later bombed by Rena. Shuichi is also a highly proficient hand-to-hand combatant. Having extensive skill and knowledge of Jeet Kune Do, he taught his sister Sera much, who openly acknowledges him to still be much stronger than her. In the Bus Jack case, Shuichi's combat skills was hinted as he was ready to strike one of the criminals before Conan hit him with the tranquilizer dart. During the Ikkaku Rock case, Shuichi expertly knocks a knife out of the criminal's hand unarmed. In the Communications Code case, Shuichi incapacitates a robber off-screen, later telling the Detective Boys that the robber fell down the stairs. Though subtle, Shuichi also swiftly knocks out a drunkard harassing Officer Yumi (at the request of his younger brother) in the Policewomen Serial Murder Case. Shuichi learned how to cook thanks to Yukiko Kudo, and often uses his dishes as an excuse to interject himself into cases at Professor Agasa's house. Shuichi learned how to act and properly apply his Okiya disguise by himself thanks to Yukiko Kudo and equipment from Professor Agasa. He apparently at one point held a part time job playing the accordion. Shuichi appeared in this movie as Subaru Okiya. At first he is seen watching the Detective Boys testing Professor Agasa's invention. Later after Masumi Sera gets shot, he is seen leaving the hospital, where she is hospitalized. After that he is seen involving himself in the sniper investigation. He is the one who shoot the suspect at the last part. We can see too that he turn off his voice changer and said to James "Roger" (了解 ,ryōkai?) as signal that it's already finished. James Black's English background may have assisted the young British-Japanese Shuichi Akai in fast-tracking his way to a US citizenship and then enrolling in the FBI. Shuichi Akai and Akemi Miyano were lovers while he was infiltrating the Black Organization. Shuichi's original mission was to date Akemi Miyano in order to meet Shiho Miyano. Shuichi used Shiho's influence to gain rank in the Organization, intending to become trusted enough to meet with high level agents so the FBI could capture one for questioning. As James Black later recalls, although Shuichi's relationship with Akemi was merely a stepping stone, Shuichi actually fell in love with Akemi, and considered her his real girlfriend. Because of this he broke up with Jodie Starling. The last text message Akemi had sent Shuichi, before her death. Sometime later, Akemi develops the suspicion that Shuichi really wasn't who he claimed to be. After Shuichi's expulsion, he confirms that he is an FBI agent to her. To Shuichi's surprise, Akemi doesn't seemed surprised by this, so Shuichi asks her why she never said anything about her suspicions that she was being used by him before, and Akemi hints it is because she loves him. Initially, the Organization couldn't do anything about Akemi because they needed the loyalty of her sister, but two years later they decided that the risk of her contact with Shuichi was too much. They decided to create a situation where they could eliminate her by having her do a bank heist she was supposed to fail. Sometime near the day of the heist, Akemi sent Shuichi a long text message, asking him if he wants to be her real boyfriend when she is finally free from the Organization. After the heist, Akemi is killed by Gin, and it is unknown how Shuichi responded if at all. Shuichi treasures her final text message, and keeps it in his phone many months after Akemi's death. The message also contains a P.S. which has not been revealed yet. How Akemi and Shuichi met in the manga is unknown, but in the anime, Shuichi Akai originally met Akemi by an intentional accident. She accidentally hit him with her car when he deliberately walked into the street in front of her in order to be hit by her. Akemi was concerned, and helped take him to the hospital, watching over him until he was better. When he woke up, he felt no anger over what she did, and even asked for her name, to which a very flustered Akemi replied, while he told her his fake name: Dai Moroboshi. After this they began dating. While Jodie and Shuichi's relationship had been viewed as mere colleagues, it is revealed later on in the series that Jodie and Shuichi had dated before about 5 years prior. However, after Shuichi infiltrated the Black Organization under the alias of Dai Moroboshi, he started dating Akemi Miyano in hopes of using her to attain information about the Black Organization. Despite this, Shuichi ended up falling in love with Akemi, leading him to break up with Jodie, stating that, "To be able to love two women at the same time…it's not that handy a personality." In spite of the break-up, Jodie still held strong feelings for Shuichi which never wavered as time passed and took his apparent death at Kir's hands especially hard, to the point of being reduced to tears. James Black is the boss of the FBI agents in Japan and therefore the boss of Shuichi. He was one of those who know that Shuichi was alive after Shuichi's fake death, but only because he saw the glue on Shuichi's fingers and would have otherwise also been kept in the dark. The two maintain close contact with each other up to present. Andre Camel worked with Shuichi Akai before when he was an agent in the Black Organization. Camel was involved in the plan to capture Gin two years ago, but he gave away the plan of the FBI when he saw a member of the organization disguised as an old man. Because of this, Shuichi's identity became known to the Organization. However, Shuichi does not seem to bear a grudge against Camel but worked together well. Camel is willing to help Akai in any way he can to redeem for his mistake. When Haibara first met Shuichi, she thought he was a member of the Black Organization. Shuichi seems to know of Haibara's identity. Haibara knows him as Dai Moroboshi, her sister's boyfriend who betrayed the Organization. Haibara should know Dai was a spy and FBI agent, after hearing an exchange between Bourbon and Kaitou Kid through a microphone, but she does not know him by the name Shuichi Akai. During his time in the organization he became acquatained with Haibara, while she was still known as Shiho Miyano, through Akemi and make use of it to slip into the organization. He made a promise with Akemi to look after Haibara's welfare. She doesn't know that it was because of the relationship between Akai and her sister, that got her sister killed. Shuichi and Conan get along well and are capable of thinking on par with one another. 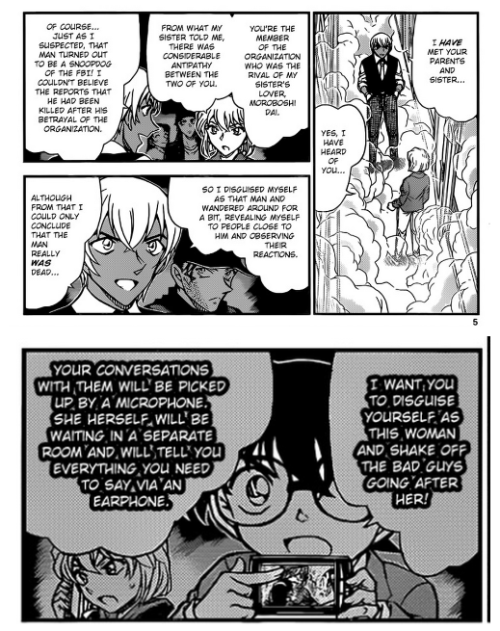 In the short time they have worked together, Shuichi has come to respect Conan's intellect and deductive skills and speaks to him professionally. After FBI had capture Kir, he asked who Conan was, hinting that he suspected that there was more to Conan that meets the eyes. He is also aware that Conan and Shinichi Kudo are really one and the same person . There is further speculation amongst fans that Shuichi has figured out that Ai was formerly Sherry and (more than likely) learned about her research for the Black Organization and the two possible effects of APTX 4869. Masumi Sera is Shuichi's younger sister. Masumi wasn't born yet when Shuichi went to America to study, so they first got to meet each other, when Masumi was seven. It's indicated at Shuichi cares for his sister. During the mystery train case, when Masumi was knocked out by Vermouth and hidden in her room, Shuichi (disguised as Subaru) carried her back to her own room. As he was about to leave he overheard her calling out 'Shuu-nii' in her sleep, which made him smile. And in the movie Dimensional Sniper he (as Subaru) was seen leaving the hospital, where Masumi was hospitalized after getting shot, hinting that he was visiting her. While she was unconscious, he left a bouquet in her room, which Ran and Sonoko find. Shuichi's mother hoped that Shuichi would become a father figure to Masumi to replace their missing biological father. While Masumi was growing up, Shuichi would send her training tapes of Jeet Kune Do that she could practice after. To avoid unintentional spoiling, please click the link for information on the Akai family's middle brother. Hidemi is a CIA agent undercover in the Black Organization as Rena Mizunashi, codenamed Kir. She agreed to supply the FBI with information of the organization in return for her brother's protection. She, Akai and Conan worked out the plan to send Hidemi back to the organization and fake Akai's death. Shuichi Akai and Gin are rivals and hate one another. It is implied that they didn't get along even before Shuichi was exposed as an undercover FBI agent. Shuichi refers to Gin as "Koibito", which ironically means 'lover.' Gin killed Shuichi's love Akemi, so Shuichi thinks of Gin as his archenemy. Shuichi Akai and Bourbon are stated to be enemies. It's been stated that Bourbon hated Shuichi more than Gin did. Bourbon believed himself to be the only one capable of killing Shuichi, and refused to believe that Shuichi was dead. Shuichi feels neutral toward Bourbon, saying that he is not someone that he wants as an enemy. He even considers him one of 'the two best detectives' (the second one being Conan). Bourbon's hate of Shuichi is explained in the manga: Between four years ago and two years ago, Shuichi was found by Bourbon, standing over Scotch's dead body holding a smoking gun. Ever since then Rei has blamed Shuichi and has sought out to kill him. In reality, Shuichi tried to stop Scotch from commiting suicide, but Scotch pulled the trigger on himself because he thought that his undercover operations were found out. To protect Scotch's secrets, Shuichi made it look as if he had killed him. A relationship between Shuichi and Kohji Haneda is unknown, but the case of Kohji's death made Shuichi an FBI agent. eBookJapan held a character popularity poll from April 12, 2011 to May 12, 2011 in which readers of Detective Conan (international included) could vote for their favorite character. Shuichi placed 12th in the poll with 53 votes out of the 5,883 that were cast. In honor of the release of the 800th manga chapter, Shonen Sunday held a popularity poll/contest containing 91 Detective Conan characters to choose from. Shuichi placed 7th overall with 415 votes. Akai's name comes from the Mobile Suit Gundam character Char Aznable, whose nickname was the "Red Comet" (赤い彗星 ,Akai Suisei? ), and Char's voice actor Shuichi Ikeda (who is also Akai's voice actor). Additionally, his alias, Dai Moroboshi, comes from Char's real name, Casval Rem Deikun (sounds like Dai-kun in Japanese). Moroboshi can also mean falling star, another possible allusion to Red Comet. Shuichi is a Jeet Kune Do practitioner who is three times stronger than Masumi. The three times is, again, a reference of Char's mobile suit being three times faster than the others. Shuichi Akai's voice actor, Shuichi Ikeda, is the real-life husband of Akemi Miyano's voice actress, Sakiko Tamagawa. ^ a b Manga Volume 58, File 2, pg 9: "Akai's Past"
^ Manga Volume 58, File 2, pg 10: "Akai's Past"
^ Manga Volume 49, File 2, page 13: "New Order"
^ Shuichi's fake death, while preserving Kir and allowing her to pass confidential information to the FBI, has caused significant dysfunction within the FBI who believe him to be truly dead. While Shuichi has technically been fulfilling the promise he made to look after Haibara's welfare as Okiya, he has executed it in such a way that made Haibara terrified of his presence and refused to be alone at Agasa's house when he was around. ^ Shuichi didn't inform Akemi he was an FBI agent despite being in love because it might jeopardize his mission (and his relationship). Even though Akemi figured out Shuichi was an FBI agent and wished to leave the Organization and date him seriously, she kept it secret from him either because she was not sure how he would react, or because she thought it could cause him harm. Thus, the infiltration mission was the root cause of their secretkeeping which prevented them from coming up with an exit strategy for Akemi in case the mission failed. The following chain of events led to Akemi's death. ^ Shuichi's faked death to save Kir's mission and get her to pass information to the FBI as well demoralized the FBI, especially Jodie. ^ FBI vs Org, Shuichi didn't tell the rest of the FBI he would cover Kogoro's agency. In Red vs Black, the return Kir plan and the fake death plan were both kept secret from the FBI. He ordered Camel to remove by force if necessary anyone who interfered which resulted in Jodie being knocked out. He later told Kir to hit Camel for real to make her escape look authentic. ^ In FBI vs Org, Shuichi was forgiven for covering Kogoro without telling his boss and for making the decision on his own to let the Black Organization leave without much resistance because he thought it might lead to a dangerous firefight downtown. In Red vs Black, Shuichi was forgiven after being told off for hiding his secret plan to return Rena to the Org. ^ In particular, his faked death had a major impact on the FBI and Jodie Starling. Bourbon was able to take advantage of the emotional confusion surrounding his death to approach the FBI for his own ends. Jodie's sorrow has reduced her effectiveness and led her to blunder into dangerous situations. ^ Left eye for shooting Vermouth in New York, left eye for sniping Gin in Black Impact, Right eye for shooting Rei's subordinates' car in Scarlet Showdown. ^ Manga Volume 41, File 7, page 14: "The Enclosing Surrounding Net"
^ Manga Volume 85, File 5 (898), pg 2: "Scarlet Epilogue"
^ Manga File 802, pg 10: "Don't make that kind of face..."
^ Manga Volume 65, File 3 (677), pg 5: "The fated individual"
^ "『名探偵コナン』 人気投票結果". eBookJapan. 2011-05-12. http://www.ebookjapan.jp/ebj/special/conan/vote_kekka2.asp. Retrieved on 2011-05-15. ^ In Moroboshi (諸星), the first kanji can be broken up into 言者 which when pronounced as げんしゃ (gensha) sounds very similar to the word for "phenomenon" (genshou). The second character (星) means "star". Moroboshi, read as "Star phenomenon" references falling stars or maybe comets. This page was last edited on 17 April 2019, at 04:52.